BEIJING, China, February 12, 2013 (ENS) – To help cut record levels of air pollution in Beijing, the city is making zero-emission and alternative-energy vehicles more desirable by imposing strict limits on emissions from petrol-powered cars. 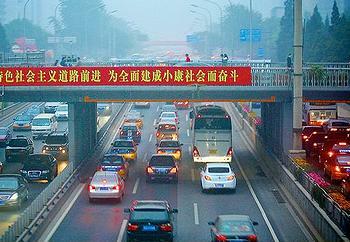 On February 1, Beijing began implementing its toughest-ever emission standards for diesel-fueled vehicles. The new code is similar to the Euro V standard designed to curb concentrations of fine particulate matter, PM2.5. Readings for PM2.5, or airborne particles with a diameter of 2.5 microns or less — small enough to deeply penetrate the lungs — were as high as 993 micrograms per cubic meter of air on a Saturday evening in January. The Beijing Municipal Environmental Protection Bureau said there will be a ban on diesel cars that fail to meet the standard. The sub-standard vehicles can no longer be sold or registered in China. The sale and registration of sub-standard gasoline cars will be banned from March 1. The new standards apply to all new vehicle registrations, not to vehicles already on the roads. The Beijing Municipal Environmental Protection Bureau has approved more than 1,300 models that meet the new standard and the bureau will give out blue labels for these vehicles. The move is welcomed by the city’s residents. In recent years, the permanent population in Beijing has been growing by over 400,000 annually, said Qiao Shufang, an official with the Beijing Municipal Environmental Protection Bureau. There are also 400,000 new vehicles on the city’s roads each year, increasing the difficulty of treating air pollution, Qiao said, adding that the growth has put great pressures on the city’s pollution control efforts. China as a whole will take effective measures to limit the total amount of nitrogen oxide emitted by vehicles and intensify supervision over the production, use and elimination of motor vehicles, Tao Detian, a spokesman for the Ministry of Environmental Protection, said in January. “When electric cars penetrate the market, they will significantly reduce urban smog,” said Ghosn, who is confident that Renault and Nissan electric cars will appeal to Chinese buyers. Nissan, a Japanese corporation, has created a joint venture with China’s Dongfeng Motor Group to make and market passenger cars. 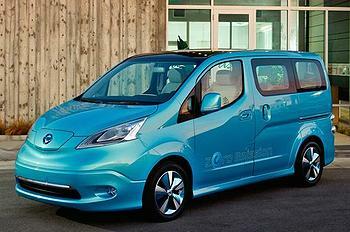 At the 2012 Beijing Auto Show last April, Dongfeng Nissan unveiled the brand’s first electric concept car, called simply e-concept. E-concept will be built locally in China and sold under the Venucia brand by 2015, says Ren Yong, deputy managing director of Dongfeng Nissan.